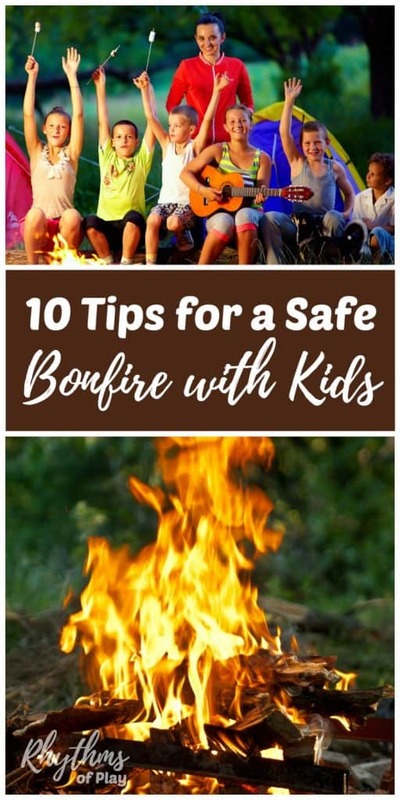 There are many things to keep in mind in order to have a safe bonfire with kids. As the sister to smokey the bear himself, my brother was a park ranger for 15 years, I know first hand how dangerous bonfires can be, and how quickly they can get out of control. 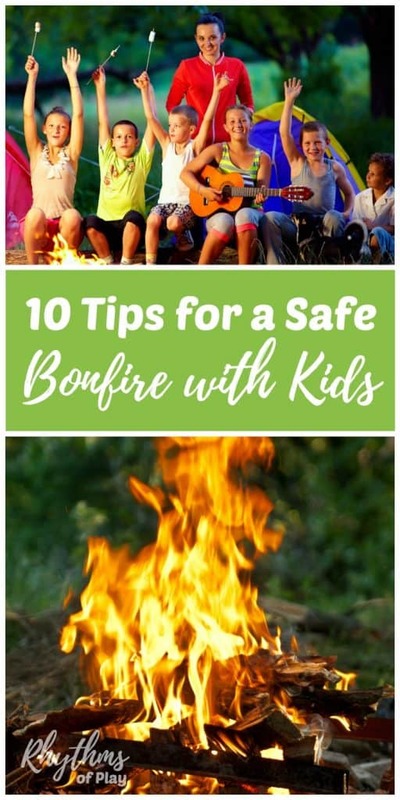 Below you will find bonfire safety tips to have a fun and safe campfire with children. 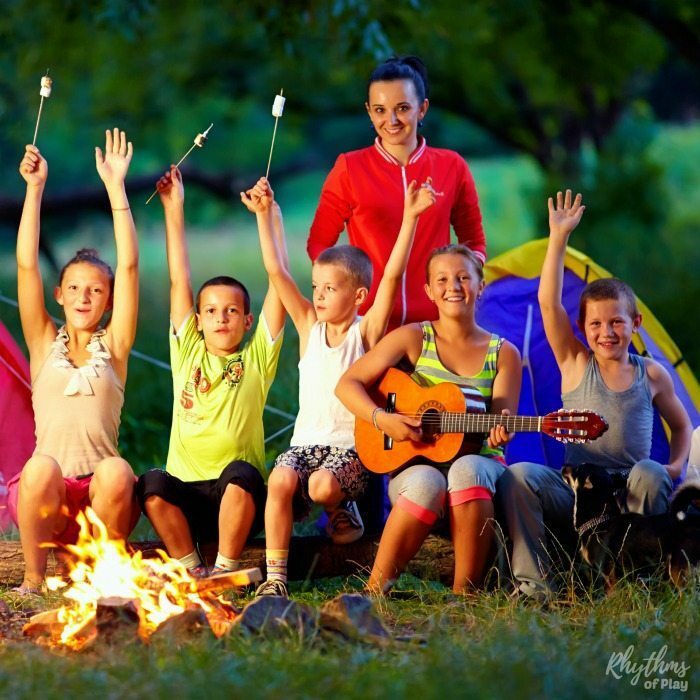 How to have a safe bonfire or campfire with kids. 1. Teach children how to be fire safe around a campfire or bonfire. Assume it’s hot – teach your children to assume anything and everything around a fire is hot. Even the metal on the chairs we sit on can become hot enough to cause a first-degree burn. Keep a safe distance – teach your children to always keep a safe distance from the fire, unless they are roasting marshmallows under the direct supervision of an adult. No horsing around near the fire – Accidents are more likely to happen when horsing around is involved. Keep it away from the fire. Don’t poke at or throw anything into the fire – Do not allow your children to poke anything into the fire or throw anything into the fire or someone is likely to get hurt. Teach them what to do if they ever catch on fire–stop, drop and roll. Amy from Around the Thicket made a wonderful suggestion in the comments below. Have a bonfire play session around a pretend campfire before a real any real fire is involved to teach children how to be fire safe. Check out this beautiful felt campfire you can use! 2. Supervise children (and pets) near a bonfire at all times. Never leave children (or pets) unattended near fires. Check with local authorities about when and where bonfires are allowed in your area. You may need a fire permit. Some counties only allow bonfires in designated areas at certain times of the year. Never have a bonfire close to trees, shrubs, tents, homes or other structures. Make sure your campfire is not under tree branches. Have a bonfire in a spot with no dry brush around. Clear the area around your campfire at least 10 feet away from your fire pit. 4. Only use hardwood for a bonfire or campfire. Softwood such as pine is more likely to throw off sparks that can easily burn someone or start a fire. Use a hardwood for your bonfire such as oak that has been dried or cured to avoid this danger. Never cut live trees or branches from trees. Green uncured wood produces more smoke, smaller flames, and less heat when they are used for campfires. How do you build a bonfire or campfire? Make a tipi with a few pieces of dry hardwood. Place dry tinder (newspaper, twigs, leaves, bark, pine needles, etc.) and kindling inside and around the hardwood tipi. How do you start a bonfire or campfire and keep it burning safely? Light the tinder on fire. Do not use fire accelerants. Add wood slowly once the fire is well established. Add pieces of wood to keep it burning steadily, as opposed to making the bonfire bigger. Choose a responsible adult not consuming alcoholic beverages to keep the fire safely contained at all times. Pay attention to the wind direction and strength. Keep it safe, small, and manageable. Add pieces of wood to keep it burning steadily, as opposed to making the campfire bigger. 7. Keep a hose or buckets of water, and blankets nearby. It’s always best to be prepared in case of an emergency. Bonfires and campfires can get out of control quickly when we don’t take proper safety precautions. Have a hose or buckets of water nearby and/or fire safe blankets to throw on the bonfire or anyone that catches on fire. Even when we are following all safety protocols accidents happen. Knowing basic burn first aid can help. Run cool (not cold) water over on a minor first-degree burn for 10-15 minutes. You can also use a wet towel or item of clothing. Once burned the skin will continue to burn until it is cooled. Cool water will help stop the skin from continuing to burn. Leave small blisters alone. Do not break them open or pop them. In the event of a more serious burn. Cover the wound with a cool moist sterile bandage (or a clean cloth) and call 911 or transport immediately to the nearest hospital. How do you put out a bonfire or campfire? Allow wood to burn completely to ash if possible. Pour lots of water on the bonfire to drown all embers. Pour water into the campfire until the hissing sound stops. Stir with a shovel until everything is wet and cool to the touch in the bonfire pit. Alternatively, you can use dirt but don’t bury the campfire. A buried fire can continue to smolder until it reaches roots and can eventually cause a wildfire. Stir the dirt just as you would water. Dirt will take a lot longer to cool. There is nothing better than sitting around a bonfire with friends and family enjoying stories, jokes, songs, good food, and good times. Make sure you have food on hand to enjoy and don’t forget the marshmallows and marshmallow skewers . Keep in mind it is best to cook over hot coals than a fire. Use cookware safe for fires and follow safety protocols to keep from getting burned. I know too many people that have burned themselves trying to pull food off a fire. Please be safe and enjoy yourself. A bonfire is not complete without a few of the best campfire songs! Click on the link to see the suggested bonfire songs for children below. Kids Music that won’t Drive You NUTZ! These are all things to keep in mind when having a bonfire with kids. Bonfires are always best when everyone goes home (or to bed) safe and happy. Following these simple tips makes that a lot more likely. Be fire safe! For more outdoor fun be sure to check out this collection of outdoor learning and nature activities for kids. You may also like this collection of nature crafts and art activities that use natural materials. 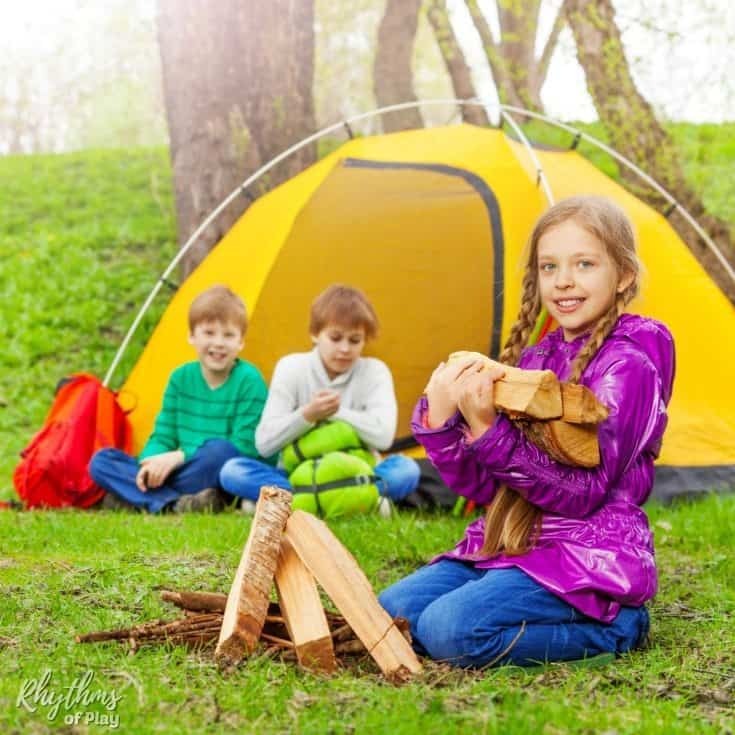 Both lists contain a lot of fun activities that you can do with the kids when you take them camping. Something I’ve seen in books on forest schools is to build a pretend fire with the children and teach them the rules as you play together – before there is a real fire involved! That is an EXCELLENT tip Amy! Thank you so much for sharing it!